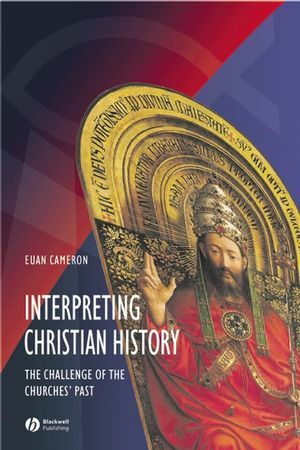 Euan Cameron, former Professor of Early Modern History at the University of Newcastle, now Henry Luce III Professor of Reformation Church History at Union Theological Seminary in New York, has written a fascinating and, in many ways, remarkable study. It contains much that may be of interest to professional religious historians, to historians of ideas, to students and teachers of theology, and to the general reader. In addition, its approach neatly demonstrates the dilemmas facing historians of Christianity who are themselves religiously committed, and the contrasting audiences for writing on Christian history. Cameron’s central enterprise, as outlined in the Preface and developed in the Introduction, is one that is of pivotal importance to many historians of religion in general, and of Christianity in particular, yet entirely beside the point to others. The usefulness of studying Christian history for many, if not most, Christians lies in the degree to which it aids the process of identifying which elements of the inheritance of one or other of the denominations constitute part of the ‘core’ of the faith, and which may safely be reformed, re-ordered, or discarded. This set of priorities may well be familiar to church historians working in some denominational theological colleges, and also conceivably (although less likely) in university departments of theology or divinity. Cameron rightly identifies the damage done by an uncritical use of the past to settle issues in the contemporary church, and the problematic nature of the notion of a timeless, ‘pure’ core content that can be traced developing under the guidance of the Holy Spirit throughout the millennia of the Church’s history. As the archbishop of Canterbury recently put it, ‘When people set out to prove that nothing has changed, you can normally be sure that something quite serious has’ (1). In many ways, this view of the history of doctrine as the progression and ‘emergence’ of key ideas, detached and floating free of context and free from the minds required to think them, sounds very much like the style of writing of the history of political ideas that Quentin Skinner so effectively destroyed over thirty-five years ago. The second, and diametrically opposed, approach is that prevailing in most secular history departments. This sets aside entirely all consideration of the ‘truth’ or otherwise of religious statements and practices, and seeks to understand those statements and practices purely in terms of their functions in the society in which they are embedded and from which they grow. To pose questions of ‘truth’ attracts the taint of the most partisan historical writing of the past, most often, but not exclusively, concerning the Reformations. Having delineated this seemingly irreconcilable opposition, Cameron seeks to identify a Third Way, for which this volume is both a manifesto and a series of exploratory essays. Nailing his own colours firmly to the mast, he correctly identifies the fact that for most Christians the adoption of a thorough-going relativism — the abandonment of any core in historic Christianity — would surely be difficult to accept. Thus to capitulate would truly be to build one’s house on sand. For Cameron, there does exist an ‘essential Christianity’, reflecting the immutable nature of God. However, all visible Christianities are always and everywhere a composite of this eternal core, and the inevitable situation of the Church and its members in particular places, cultures, and languages. Cameron then looks to assert that, whilst it would be impossible ever to sort out definitively the core from the time-bound and conditioned, it is nevertheless possible for historians, by a process of ‘triangulation’ of different periods and churches, to infer useful things from the churches’ past. After a brief overview of Christian history in chapter 1, designed mainly for the non-specialist reader, in chapter 2 (‘Constantly shifting emphases in Christian history’), Cameron looks to draw out some examples of periods in the churches’ history in which a particular and repeating pattern of development can be detected. For Cameron, Christians have often collectively seized upon a particular practice or doctrine as particularly expressive of a need or useful as a tool. These particular elements of the faith, often blameless and indeed admirable as means of Christian perfection, have often become ends in themselves. Such practices have often then been elaborated upon and developed in such a way as to conflict with, and distract from, other, arguably more important, principles, thus leading to an unbalanced and distorted whole. These shifts of the centre towards one extreme or another are often accompanied by a lesser, but nonetheless clear, counter-movement, such as the emergence of Lollardy in the context of late-medieval sacramentalism. Sometimes, but not always, these imbalances have led to the outgrowing structures collapsing under their own weight, and a re-balancing of the church occurring — a prime example being that of the Reformations. Without claiming that the ‘core’ elements thus obscured and then recovered are necessarily easy to discern, Cameron convincingly lays out examples of such a pattern in the medieval church, taking in examinations of asceticism and martyrdom in the medieval period, and Protestant emphases on catechesis and the integrity of the visible church community since the Reformation. Cameron is not concerned to establish any grand narrative of why this pattern should be, although he provides much material for the theological pursuit of such a question as he proceeds. His aim, and one which is achieved, is to demonstrate the pertinence of such a pattern, and the use of a wide enough historical lens to discern it, for the enterprise of writing Christian history. Chapter 3 examines the status and development of church history as a distinct and self-conscious activity from Eusebius to the late-twentieth century. Whilst making no claims of exhaustiveness, this section is an admirably concise and, on the whole, convincing narrative of changing priorities, and fills a gap in the literature. In order to show that his approach is not purely a late-twentieth century exercise in relativism, Cameron demonstrates that historians of the churches have for five centuries been dealing with just such an awareness of the flawed and time-bound nature of the historic church. The writing of church history is to a great degree predicated upon the ecclesiological point from which one begins. Particularly interesting is Cameron’s account of the development of the relationship of sixteenth century theologians, both Protestant and Catholic, with the Catholic past. The crucial shift in Reformation church history was the jettisoning of any emphasis on the integrity of the hierarchy as a mark of the True Church, and the relocation of that essence in the presence of a saving remnant, however small. Christian thinkers were for the first time faced with the task of identifying how and why the institutional church could have become so corrupt as to cease to be a True Church. This necessitated a new relationship with the historic church. Cameron also draws out the incongruous co-existence of this increasingly critical approach to sources with the continued attribution of influence to divine or Satanic agency, and the reading of church history through the prism of the Apocalypse. As his narrative proceeds into the modern period, Cameron rightly identifies the crucial nineteenth-century withdrawal of professional historians from explicit theological reflection on the implications of their work; a task that was picked up almost at the same point by theologians, and latterly by sociologists of religion. In chapter 4, the work reaches its theological core, and as such is the point at which many, if not most, historians of religion may choose to stop reading. To do so, however, would be a shame. Cameron samples some of the attempts of historically-informed theologians to solve the central epistemological problem outlined in the Introduction: is it possible to develop an historico-theological method with which to begin to discern the core elements of Christian doctrine and practice from the history of the flawed, human, error-prone institutions that are the churches? Whether or not the reader accepts the validity of, or sees any point to, such an undertaking, there is much suggestive material for historians of ideas along the way. Fascinating conjunctures are presented between Hegelian thought and the currents within German liberal Protestant theology of the nineteenth century. The reaction of Karl Barth, in the context of the turmoil of world war, against the profound optimism concerning human nature of many of his predecessors also suggests many fruitful avenues of new research. For this reviewer, with interests in British history, the absence of British, and in particular Anglican, theologians from this endeavour is striking, and indicates much about the Church of England’s own and perhaps rather particular view of its own past. What is perhaps of the greatest general interest in this section is the picture it gives of a sister discipline to history grappling with many of the same issues relating to language and epistemology, globalization and social change that have exploded to the surface in recent years. In summary, Cameron has produced a work that, whilst unlikely to surprise period specialists in matters of detail, may profitably be read as an examination of a crucially important part of church history, and as a peculiarly fascinating meditation on Christian history, theology and the relationship between them.